TANKED YEAST Kevin Robinson runs Divine Brewing at Sonoma Springs Brewing Co., bringing wine knowledge to brewing. When Kevin Robinson left his position as head brewer at Speakeasy Ales and Lagers in 2008 to work as the production manager at V. Sattui Winery in St. Helena, it was never with the intent of staying in the wine business. As Robinson puts it, "I wanted to learn the way of the grape and bring this knowledge back to brewing." 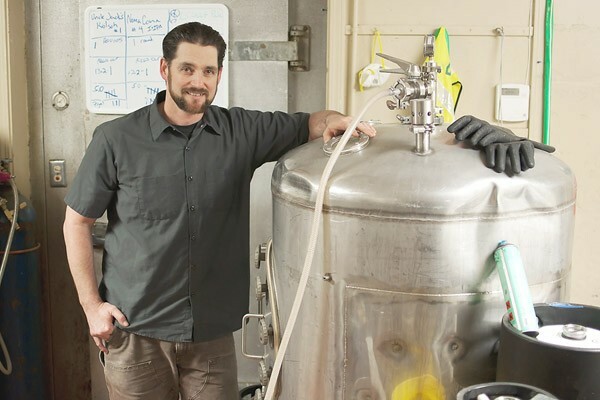 He started his current venture, Divine Brewing, in his spare time, renting brewhouse capacity at Sonoma Springs Brewing Co. Shortly afterward, Robinson was approached by Russian River Brewing Company in Santa Rosa about coming on board as a brewer. In meeting with brewmaster Vinnie Cilurzo, the first thing Robinson brought up was his new side venture, which he wasn't willing to abandon. "Not only did they say no problem," Robinson remembers, "but Vinnie also said, 'Look, if there's anything I can ever do to help you, we'll do it.'" Thus, Robinson currently spends his days at the Russian River production facility, and his nights and weekends working on his own label. Divine Brewing is a small-batch, bottle-only brewing operation that's a reflection of lessons learned in both the beer and wine worlds. The brewery's first release in the fall of 2011, called Teufelweizen ("toy-ful-vite-sin," give or take), was packaged in a black wine bottle and fermented with three different yeast strains, including a wine yeast. As Robinson describes his packaging approach, "I wanted it to be at home on a white tablecloth." While not brewed to a traditional style, the Teufelweizen perhaps most closely aligns with the German weizenbocks, a hybrid style straddling the yeast-driven territory of a weizen (think: banana, clove) and the malt-driven intensity of a bock (think: caramel, dried fruit). It's a style that tends to be pretty challenging to brew well, requiring both a restrained sweetness and careful yeast management know-how to dial everything in. The Teufelweizen is a stellar twist, showing vinous fruitiness and spicy cloves atop soft crème brûlée notes. Most contemporary breweries, particularly in the United States, ferment with a single strain of yeast. The wine world isn't much different in this regard, but yeast-forward wines are far less common than yeast-forward beer styles (German hefeweizens, Belgian ales across the board, etc.). Particularly for brewing styles like these, one yeast strain doesn't always fit the bill. In his previous position at Speakeasy, Robinson was limited in this regard. "We were really bound by using that one yeast strain," he says. In the Teufelweizen, the three yeasts each play a part. The primary fermentation is done with classic Weihenstephan weizen yeast, offering up that banana-clove medley of flavors and aromatics. The wine yeast is added halfway through, further drying out the beer and contributing additional notes, while the third yeast is used for bottling, specifically chosen because it actually degrades pleasantly over time. "I wanted to make beers that can age," notes Robinson. While most beers, especially anything hop-forward or lighter in alcohol, are best consumed as fresh as possible, there are notable exceptions. High-quality barley wines, imperial stouts, and sour beers such as Belgian lambic (not the sweet Lindemans stuff) can last and further develop for years in the bottle. The decision to release only bottled beers (i.e., no kegs) was a consequence of both a desire to make cellar-ready beers and of directly seeing how kegged beers were often treated during his time at Speakeasy. "As a brewer, you can do so much to ensure that your product going into keg—even the cleaning and sanitizing of the keg itself—is pristine, so that what leaves your brewery is perfect. And yet, if the bar isn't doing really anything to their tap lines, it will only take a couple days for the tap line to take down the keg." For the time being, Divine Brewing's production will be limited to two releases, synced with the spring and fall equinoxes. Albeit a touch late last year, the Teufelweizen will be Divine's regular fall equinox release. Until Robinson's operation can expand beyond its current arrangement at Sonoma Springs, he'll be focusing solely on those two releases. Which brings us to today. While the spring equinox has already come and gone, the second beer from Divine Brewing will be released within the next few weeks. Called Engelen Tarwe (your guess is as good as mine, pronunciation-wise), Robinson describes his latest beer as being closest to the Belgian tripel style, albeit with the added contributions of coriander, bitter orange peel and the West African spice grains of paradise. Engelen Tarwe will only be available in bottles, like the Teufelweizen, and it's also been brewed using three different yeast strains. The best place to look locally is Bottle Barn in Santa Rosa, and bottles also make it down to San Francisco and the East Bay. The bottles themselves include a number of, let's call them, hidden features. Though Divine's motto was written in German on the Teufelweizen labels, it will appear in Dutch on the Engelen Tarwe ones. Either way, both are translations of an aptly chosen phrase: "Refuse to compromise." Ken Weaver is a beer writer, fiction writer and technical editor based in Santa Rosa. He's also the author of 'The Northern California Craft Beer Guide' with photographer Anneliese Schmidt, due out this June from Cameron + Company. Tags: Dining, Kevin Robinson, Divine Brewing, Sonoma Springs Brewing Co.